patrols banks of canals, rivers, channels supplying waterworks, or of waterworks filter beds, and is responsible for their maintenance and repair; notes any defects or leakages in banks, and gives instructions to banksmen (581) (q.v.) as to necessary repairs, e.g., concreting, timbering. a foreman (q.v.) or a ganger (q.v.) in charge of men engaged on permanent way work on a railway. (ii) in building trades, see foreman, general (building trades). directs work of gang working on ballast crushing machines, and sees that work is being carried on satisfactorily; keeps records of output of machine, and of material received and sent away; if crushing is done at ballast pit, also directs work of men engaged in excavation, and records quantities of material excavated and number of loads sent away; engages and discharges workpeople, as required, usually also keeps time and wage records, and sends records weekly to employer; sometimes also superintends concrete mixing operations, i.e., mixing of ballast with cement and water, where they are carried on in conjunction with ballast crushing. supervises bricklayers (565) (q.v.) engaged on construction of brickwork; usually works under direction of general foreman (q.v. 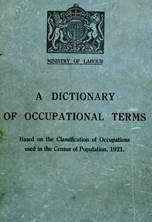 ), is responsible to him for efficient carrying out of brickwork, and consults with him as to engaging or discharging bricklayers; gives measurement and levelling instructions to bricklayers, indicates nature of bond required, i.e., style in which bricks are to be laid, and sometimes lays first course, or first two courses as a model for bricklayers; indicates, by measurements, exact position of window and door openings, and position of arches over these; sometimes draws, from working drawings supplied by general foreman, plan of particular arch required in each position. see foreman, general (building trades). in charge of gas or water main laying operations in a particular area, or is responsible for upkeep and repair of mains in such an area; receives instructions from headquarters of gas or water undertakings as to laying, or upkeep and repair, of mains, and passes on such instructions to pipe linesmen (699), pipe or service layers (578), and labourers (581) (q.v.) and directs their operations; requisitions materials from headquarters, and keeps records of materials received; reports from time to time to headquarters on progress of work; keeps time records of men employed under him; engages or discharges men, as required, directly or indirectly; sometimes tests mains, or supervises tests thereof, to detect possible leakages, using test meter for gas and stethophone for water. is responsible to employer and to architect for efficient carrying out of constructional or repair work on a building and consults with them, or reports to them, as required; gives detailed instructions to foreman bricklayer (q.v.) and other sectional foremen and to gangers (q.v.) as to work to be done; gives them correct measurements and levels, and prepares working drawings, from architect's original drawings, for their guidance; often helps in setting or laying out of work, using drawings and specifications supplied by architect; uses theodolites and dumping levels, i.e., large spirit levels, to obtain levels on building site; keeps day work records of casual workmen, and sometimes also keeps time records of all workers, forwarding these records weekly to employer; orders materials required from supplying firms, or requisitions them from employer's .yards; engages or discharges workers as required, either directly or through sectional foreman. (ii) on building site, superintends work of fixer masons (572) (q.v.) erecting stone on site, under direction of general foreman (q.v. ); for more general duties, cf. foreman bricklayer. (ii) directs operations of a large gang of paviors or of a number of smaller groups of paviors working on different sections of paving job, each under its own ganger q.v. ; sets out work according to measurements or pre-arranged plan; issues instructions to gangers or paviors regarding contours, levels, etc. ; engages or discharges workers, as required; sends time records and progress reports to headquarters. is responsible to employer, e.g., contractor, local authority, gas or water company, for efficient carrying out of drain, gas, water or other pipe laying job; directs men engaged in laying and jointing of pipes, indicating where, according to plans and specifications supplied, trenches are to be dug; sees that correct alignment and required gradient are being preserved, using various levelling and other instruments; sometimes sets out by measurement, or according to plan, exact size and depth of manholes, if any, and directs bricklayers engaged in building them; requisitions for materials from headquarters; keeps record of work done, and reports to headquarters; sometimes keeps time records of men employed, and forwards them to headquarters; engages and discharges workers, directly or indirectly, as required; sometimes also takes test readings of pipes, using compressed air testing appliances for gas, or hydraulic test appliances for water. is responsible to railway authorities for upkeep of permanent way of railways, including works, railways or works sidings, and is in charge of platelayers (577) (q.v.) employed thereon; cf. ganger (571). a foreman (q.v.) in charge of men constructing, repairing, widening or otherwise improving roads and is usually responsible to local authority; (in repair work) decides which parts of road are to be torn up with picks or with scarifier, i.e., apparatus attached to steam roller, and instructs workers as to kind of surface required; cf. foreman of street works. as for foreman, ballast crushing. a foreman (q.v.) who superintends slaters (570) (q.v.) engaged on job, and, on small jobs, works with them; consults with carpenters (474) (q.v.) as to spacing of roof battens, and with plumbers (252) (q.v.) as to lead or zinc work, so far as these affect slating operations. a foreman bricklayer (q.v.) or other sectional foreman who works at trade side by side with men whom he superintends, usually on a small job; usually works under direction of general foreman (q.v.). a foreman (q.v.) in charge of a builder's or other yard and of material or stores contained therein; keeps records of materials or stores in stock and orders new supplies as required; directs loading or unloading of materials. in charge of a gang of men, e.g., navvies, engaged on a job or on section of contract, usually under control of a foreman or general foreman (q.v. ), whose instructions he passes on to gang; is responsible for efficient carrying out of work by men in gang; sometimes keeps records of men in his gang and recommends to foreman engaging or discharge of workers; sometimes, on smaller jobs, works with the men; often specifically designated e.g. ballast ganger (railway), ballast loading ganger, electrification ganger, railway ganger, sand loading ganger. a ganger (q.v.) in charge of gang engaged in tarring iron or wood work of railway bridges; gives instructions to scaffolders (564) (q.v. ), if such are employed, regarding erection of scaffolds, ganger, drainage; a ganger (q.v.) in charge of gang of men engaged in excavating trenches and laying drain pipes therein under instructions from headquarters, e.g., local authority, or from foreman pipe layer or district foreman (q.v. ); instructs workers as to correct alignment and jointing of pipes. (ii) stands by to take place of working ganger in emergency. controls and directs work of gang engaged at place of breakdown on permanent way. a ganger (q.v.) who is responsible for supervision and maintenance of length or section of permanent way on a railway. in charge of a gang of navvies engaged in excavating soil for making permanent way of railways, or in digging foundations for buildings, or trenches for laying pipes, cables, etc. ; issues instructions as to depth and width of trenches, etc., and gauges depth of trenches or workings by means of profiles, i.e., T.-shaped timber framework, set at intervals along trenches. (ii) (roads), see foreman, road. a ganger (q.v.) employed by local authority, who goes from place to place to see that men, e.g., road sweepers, dust collectors, paviors, steam roller men, working alone or in scattered parties, are carrying on their duties satisfactorily. a foreman (q.v.) in charge of mine borers (580) (q.v.) making trial 'borings or sinking mine shafts, and is responsible to master sinker (mines) (560) (q.v.) for efficient carrying out of work; supervises erection of hauling or lifting apparatus at bead of shaft; directs borers as to boring tools to be used; sometimes works as a borer. a foreman (q.v.) employed at quarry to examine setts made by settmakers (575) (q.v. ); sees that setts are properly dressed and true to measurements. a foreman (q.v.) in charge of plane house-men (589) (q.v.). slang name given to foreman, ganger, leading hand (q.v.). (ii) in charge of masons (572) (q.v.) dressing flagstones in a yard, and works with them; keeps time records of workers and output of work.